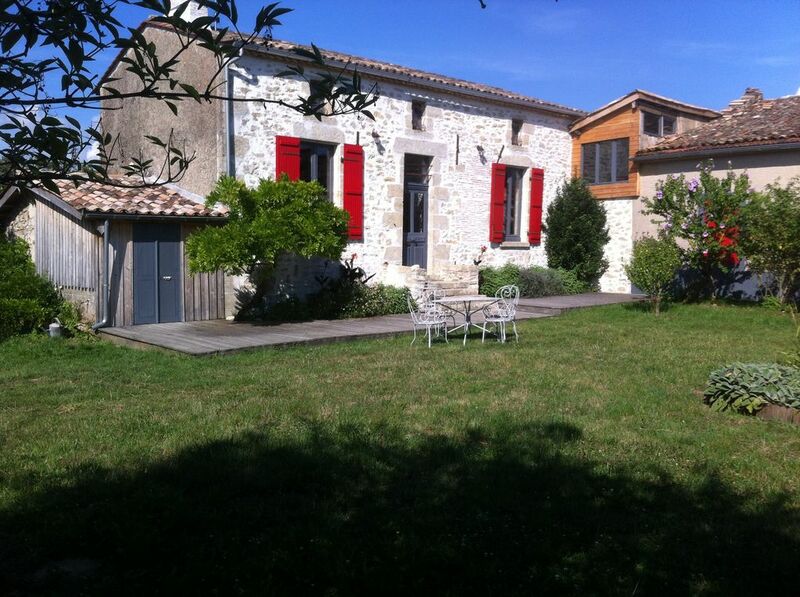 Ecological cottage in south gironde "wisteria". Located in the municipality of Saint Sève (33190), in the region of between two seas in south Gironde, the cottage is a former detached farmhouse in 2011. The health and well-being of the occupants, the less impact on the environment and respect the existing building were our main objectives for the rehabilitation of this 18th century farm which has met ecological approach, self construction and traditional skills . The cottage is intentionally devoid of some equipment (microwave, wifi ...) harmful to health. The site includes 3 hectares of land partially cultivated in organic farming (market gardening, orchards, vineyards). It is often described by guests as a true PEACEFUL. upstairs three bedroom sleeps 2 (or 6 persons), one double and 2 modular twin or double rooms (2 beds of 90 that can come together to make only one), plus a sleeping for extra mezzanine and possibility of cot. On the ground floor, a kitchen (dishwasher, fridge / freezer, stove and gas oven, wood stove, coffee maker, kettle ...), a living / dining room (25 m² with TV / DVD, stereo cd ...) bathroom (bath, washing machine ...) and WC. The exterior rooms have a private garden with two wooden terraces, parking and a shed where you can barbecue, bikes, garden furniture, racket sports, etc. ... to spend quality time with family and friends !!! Guests enjoy 3 hectares of land, its fruits, flowers and vegetables (depending on season) and Julian (the vegetable) gladly prepare you your basket of freshly harvested vegetables. Many shops and proximity to activities (biking, horse, pony, donkey, walking / hiking GR, swimming, airfield, canoeing, during private or group yoga ...). The wealth of local heritage offers you numerous visits to country houses, medieval cities, not to mention the famous vineyards and castles! Practical: located under 5 minutes from the town of Reole, shops and services. Les tarifs à la semaine sont fonction de la période entre 350 et 590 euros la semaine. les frais de chauffage (chauffage électrique et bois) en période hivernale sont en plus et à payer en fin de séjour Le ménage est à faire par les locataires, sinon un forfait ménage (entre 30 et 75 euros en fonction de la durée du séjour et nombre de personnes) doit être demandé si possible à la réservation ou au minimun 48 h avant le départ. L'acception des animaux est sous conditions, nous en parler à la réservation.